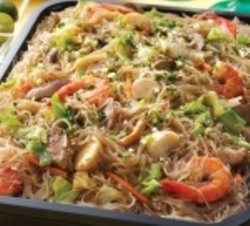 Since before town folks in Marikina city loves to eat pansit. 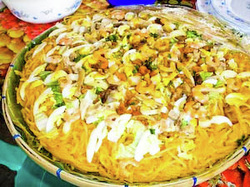 Pansit bihon, pansit malabon, pansit luglog, bihon con lechon, and many more are examples of pansit that can be found in Marikina. In Calumpang, there 3 stores of pansit and the most famous is Hesus Panciteria, the second it Dolor's pansit. In this 3 stores they serve many kinds of pansit. Boil water with a little salt. Drop miki. Cook until tender. Drain. Set aside. Soak atchuete seeds in 1/2cup water. Extract color. Add colored water to cybed pork fat, cook until water dries. Stir until oil comes out and pork becomes sitsaron. Set aside sitsaron. Saute garlic in atchuete oil. Transfer oil with garlic in a small bowl. Set aside. Put cooked noodles on a plate. Sprinkle fried garlic with oil and arrange all ingredients on top of noodles. garnish with slices of cooked egg. Serve with puto or camachile cookies. Sauce: patis and calamansi juice. Here is the recipe of homemade pansit bihon. Soak in water before cooking the vermicelli noodles. Saute garlic and onion. Fry then put the shrimp. Put the fish sauce and then mix it. Put a little water to pan because the noodles absorbs the water. Wait for the water to be all absorbed by the noodles.